It was fitting that guests had to walk pass the giant fossilized bones of a Futalognkosaurus in the Samuel Hall Curelly Gallery at the Royal Ontario Museum to take their seats for a fashion show dedicated to bone health. 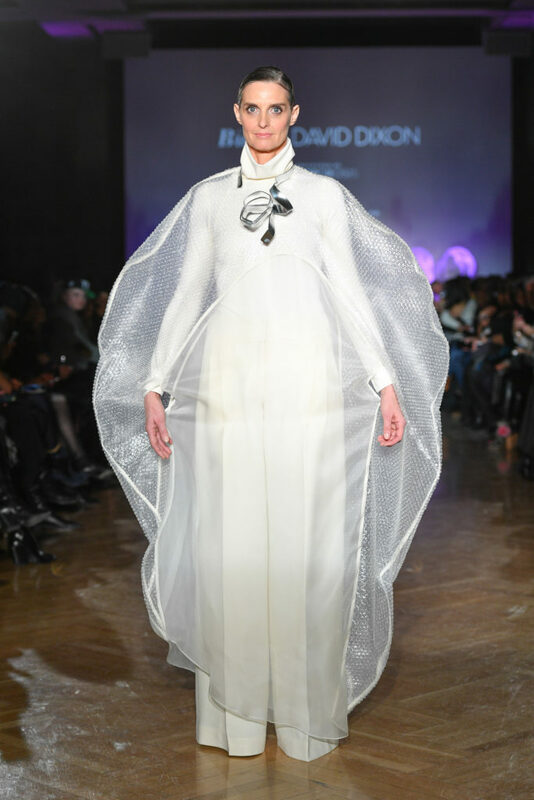 The Bubl x David Dixon fashion show on opening night of Toronto Fashion Week on Tuesday night was a partnership between Osteoporosis Canada and designer David Dixon to raise awareness of the incurable bone disease, Osteoporosis. Unlike the seemingly indestructible bones from the nearby dinosaur display in the museum, human bones can become frail with the onset of osteoporosis. The disease slowly weakens bones, making them porous and brittle overtime, without any signs or symptoms. “A big part of my job as a designer is to take the invisible and make it visible; that’s exactly what Bubl will do for this largely unseen disease,” said Dixon in a video before the show. Using ordinary bubble wrap – the instantly recognizable symbol for protecting all things fragile – the designer fashioned the lightweight plastic material into graceful ruffles on cocktail dresses and one very elegant looking opera coat. He also used blown-up photo prints of bone x-rays as a pattern on trench coats and silk dresses. But as macabre as that sounds, the effect in a watercolour blue, was more tie-dye and eye-catching. “Osteoporosis Canada’s foray into fashion week is an attempt to reach out to a new and younger audience,” said Dr. Famida Jiwa, President and CEO of Osteoporosis Canada. “Osteoporosis affects two million Canadians, including many young people that do not realize the risks they face,” she says. On a mission to make Canadians unbreakable, the national organization is encouraging Canadians to take their recently launched, Know Your Risk online quiz at www.bublfashion.ca to assess personal risk factors and how to protect themselves. Below are images from the Bubl x David Dixon fashion show from Toronto Fashion Week x RE\SET. Several pieces from the collection will be on display for the next two weeks at Yorkville Village, 55 Avenue Road, Toronto. An evening opera coat fashioned entirely out of bubble wrap. The hem of an a-line dress trimmed in bubble wrap. A little black with panels of bubble wrap. A hard plastic corset cinches the waist of a black dress. Calling Audrey Hepburn – this classic LBD features a panel of bubble wrap. A silk dress with an oversized x-ray print of bones. 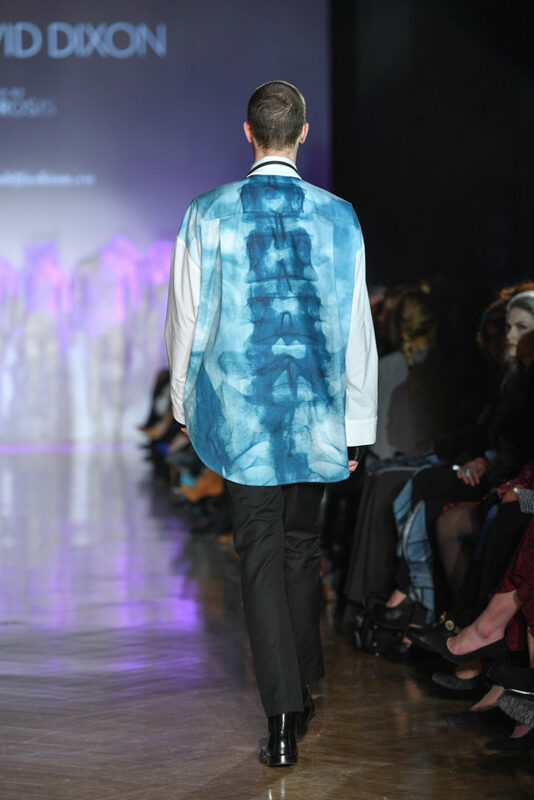 A men’s oversized shirt featuring an x-ray print detail of a spine. A trench coat featuring an x-ray print. A jumpsuit featuring x-ray printed details of bones. A white gown with an overlay of bubble wrap. The finale outfit was a bubble shaped cape fashioned from bubble wrap.